December 26, 2017 - exactly one year from the creation of this petition - will mark a decade since the Transformers Animated pilot, "Transform and Roll Out," premiered. 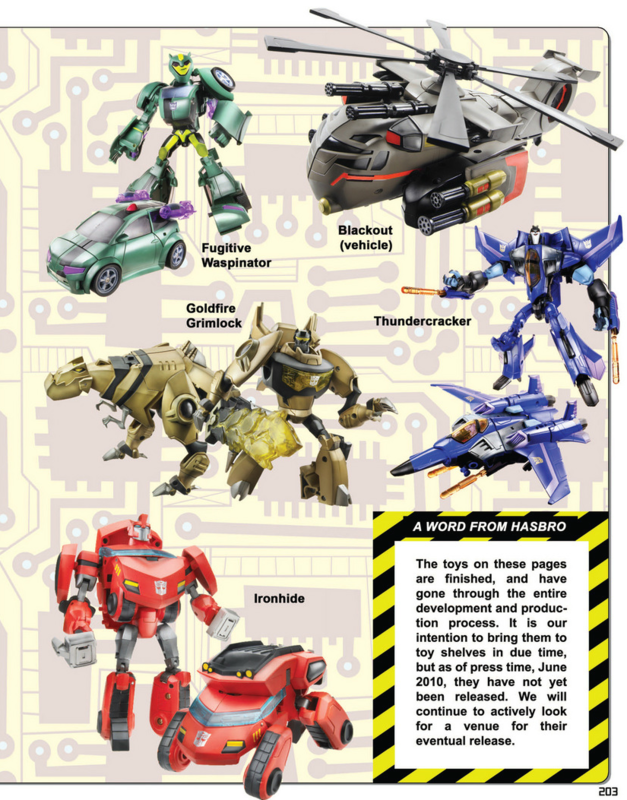 To mark the 10th Anniversary, we call on Hasbro to celebrate this much-loved incarnation by releasing the "missing" last figures of the line, including Vortex Blurr, Mercenary Swindle, Mudbuster Bulkhead, Fugitive Waspinator, Goldfire Grimlock and, of course, Voyager Thundercracker. There are still many fans mourning the loss of this series years after it ended, and although we recognize that resurrecting the show as it previously was would be complicated and difficult, particularly without a mainline toy range to support it, staff having moved on to other projects, and the parting of ways, production-wise, between Hasbro and Cartoon Network, Hasbro could fulfill their 6 year old pledge to "actively look for a venue for their eventual release" (Transformers Animated: The AllSpark Almanac, Vol. 2) as part of a Generations-branded 10th Anniversary special release. It would be a way for Hasbro to finish unfinished business, mark the occasion of the Anniversary, recognize the mark the show made for itself in the Transformers franchise as a continued point of comparison and source of other character incarnations (e.g. Prime Bulkhead, AoE Lockdown, G1 Lugnut and Lockdown and modern interpretations of Ratchet), and thrill long-time fans of the series. Aeon Magnus needs your help with “Hasbro: Release canceled Transformers Animated figures for the 10th Anniversary”. Join Aeon and 141 supporters today.